Includes FULL V Collection 6 worth Rs.43,000 for FREE! Arturia’s premier MIDI controller, KeyLab MkII represents a quantum leap in terms of control, quality, and expression. Featuring a responsive keyboard action with 49-keys, aluminium chassis, advanced configurable interface, 16 RGB backlit performance pads, 9 large faders, 9 rotary encoders, 5 expression control inputs, 4 CV outputs, smart category controls, and - of course - MIDI and USB connectivity. Included is an impressive software bundle: Arturia’s complete Piano V virtual piano instrument, Analog Lab 3, and Ableton Live Lite. A new generation of MIDI controller is here, with a focus on incredible build quality, superb durability, expressive control, and ergonomic features that are simply a joy to use, and a pleasure to behold. Everything about this controller is the result of careful thought and research. Its DAW control section feature easily switchable magnetic strips for maximum personalization. The interface is laid out in a smart way that keeps the learning curve to a minimum. Its CV functionality lets you take control of vintage outboard synths or modular devices. 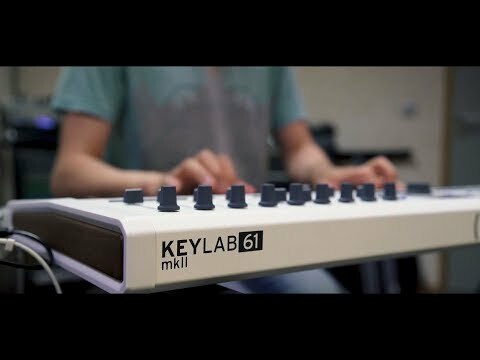 KeyLab MkII is a controller for control freaks. From its solid metal housing to its responsive performance pads; its programmable user maps to the advanced connectivity; KeyLab MkII is a controller keyboard that puts you in the driving seat. Take full control over your DAW, instruments, effects, and outboard equipment using its hugely configurable user maps, and assign any parameter you want to its multiple switches, performance pads, rotary knobs, and large faders. The focal point of a controller keyboard is often one of its most overlooked features. Not with KeyLab MkII! This total control solution features the superbly playable, luxurious-feeling keybed found in Arturia’s flagship MatrixBrute synthesizer. Calibrated to capture every nuance of your performance, from soft flourishes to hammering chords, and with aftertouch, KeyLab MkII puts the “keyboard” back into “controller keyboard”. Premium software included: every version of KeyLab MkII comes complete with inspiring software instruments, including Arturia’s venerable physically modelled piano studio Piano V, the inspiring preset collection Analog Lab, and Ableton Live Lite. No other controller comes close. It also includes FULL V Collection 6 worth Rs.43,000 for FREE! Luxury keyboard: sporting the same opulent synth keybed as Arturia’s flagship MatrixBrute, KeyLab MkII lets keyboard players truly express themselves with 49-notes. Total integration: KeyLab MkII gives unfettered access to every element of Arturia’s own software instruments. The ideal controller for V Collection owners. DAW control with magnetic overlays: with KeyLab MkII, you never need to guess if you’re hitting the right button. Magnetic overlays for the 10 most popular DAWs are provided so you can use all 16 transport controls for maximum effect. Quick access buttons: need a piano sound? Hit the piano button, and the included Analog Lab 3 software will show you your options. Want a lead, or bass? You know what to do.